The Emma mattress is an online mattress brand that has found tremendous success in the UK. Now it is available in the USA. The mattress has earned high reviews from the publication, Which as their Best Buy in the mattress category for 2018. That’s the equivalent of Consumer Reports in the United States. This mattress is a 3 layer foam mattress but they have brought along some interesting innovation giving it a unique feel. With our exclusive discount, this mattress comes in at less than $750 for a queen, making it a very competitively priced mattress. Your mattress will arrive in a box and come compressed and wrapped. This makes it easy to get into your house. Here’s what it looks like out of the box. The video below is a quick overview of the mattress. How Much Does the Emma Mattress Cost? Below are the current prices of the mattress before any discounts are applied. Below are the construction details as listed on their website. This mattress is made in the USA. The breathable Emma cover combines a premium design with climate regulating fibers which allow the mattress to breath and not retain heat like other mattresses do. At the same time, the cover flexible allowing the mattress to adapt perfectly to your body. The breathable and adaptable Airgocell®foam ensures optimized adaptability. 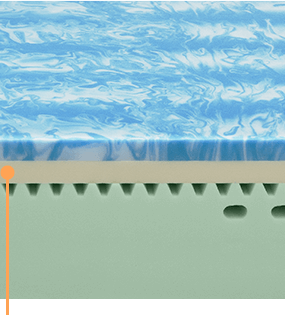 In addition to this, Airgocell®foam has an open pore structure for ideal air circulation adding to the Emma Mattress’ climate regulating design. The firm bottom layer provides the necessary counter pressure whatever your sleeping position. Here we have added our innovative German Cut-out Technology which helps to align your spine giving you a healthier night’s sleep. This technology gives you support in your lower back and shoulder areas while also helping the Emma Mattress to adapt to you. As you can see in the picture below the Emma mattress sinks quite a bit. It is even more pronounced as you add more weight. This makes it an ideal mattress for people that like to sink in the mattress and get maximum pressure relief. The video below illustrates motion transfer. Since it’s an all foam mattress, motion is contained. What I found interesting is that the top layer is very resilient and recovers almost instantly. This gives the mattress just a little bit of bounce. The cover is made for optimal airflow. It is a zippered cover so is removable as well. There is venting along the side so air can dissipate from the top and sides. The cover also grips the mattress better than other covers I have tried. This gives it a solid feel. It also has handles form making it easier to rotate and transport the mattress. 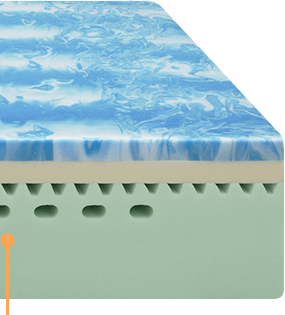 Here’s how each layer of the mattress looks. Here you can see more of the inside of the mattress and where the holes in the base layer are placed to provide better contouring for your shoulders. This video shows how each layer reacts. 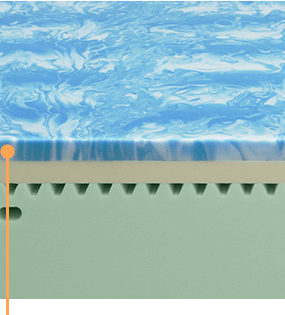 The top layer sinks and recovers quickly while the transition layer provides the support and pressure relief. The cover has handles stitched into the sides to make rotating and transporting easier. I really enjoyed the feel of this mattress. You get a somewhat soft mattress without all the drawbacks. You get to sink into the Emma but it doesn’t sleep nearly as hot as other soft mattresses. I think that’s in large part to the open cell foam layer at the top and the design of the cover. I recommend this mattress for side and back and occasional stomach sleepers that want a soft mattress where you sink into it just a bit. I found it very easy to change positions on this mattress and when you do, the mattress recovers quickly so you aren’t left with impressions. This mattress comes with a 100 night trial and a 10 year guarantee. If you aren’t happy with it during the 100 nights, returns are free as well.